Figure 1. 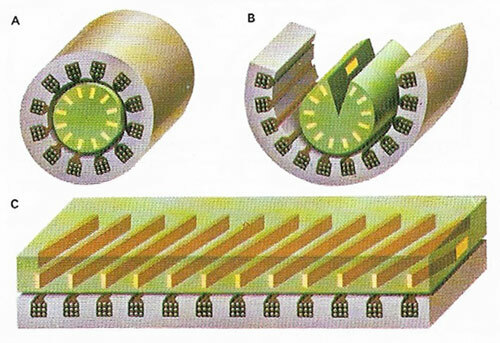 The 'rotor' of a linear motor moves lengthwise rather than revolving. It is a flat plate, either sandwiched between to long field windings or resting solely on one. Energizing the field with alternating current causes the plate to move in a linear direction, making use of exactly the same principles as an induction motor (A), from which it can be pictured as being made by cutting (B) and opening out (C). Figure 2. A linear motor used for rapid passenger transport. A linear motor is a form of induction motor first built by Charles Wheatstone (1845). It consists of a series of electromagnets, current being passed through each along the line in turn, so that a moving component (usually of aluminum) is drawn along the line (see Figure 1). The principle of the linear motor is similar to that of rotary electric motors, but instead of a number of coils rotating (a rotor) within a fixed electromagnet (a stator), the linear motor is "unfolded" so that the "rotor" windings are fixed along a path, and the "stator" windings are incorporated into the mobile object, which is both levitated and driven forward. 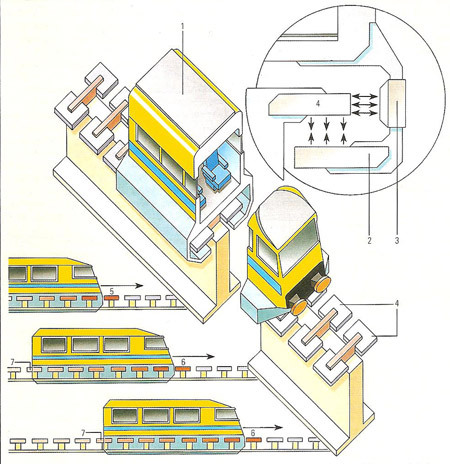 Although most commonly used to open sliding doors or in factory applications, linear motors are being considered for use in the field of rapid public transport, as shown in Figure 2. A passenger carriage (1) carries a set of powerful electromagnets (2) to lift and propel the vehicle, and a second set to guide and provide additional braking force (3). The track contains a series of electromagnets (4) that are energized to a polarity opposing the ones in the vehicle slightly ahead of the carriage (5). The magnetic forces lift the carriage and pull it forward. As it does so, the magnets ahead of the vehicle are switched on to continue to attract it forward, (6) while the magnets behind the vehicle have their polarity reversed (7) to help repel the magnets in the car and push it forward. 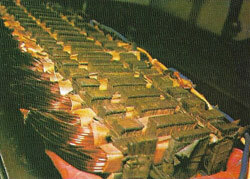 A large linear motor, with field windings similar to those shown here, could be used to drive a silent, non-wheeled train or other vehicle.